Simply the best essential oil diffuser and the newest to hit the Aromatherapy marketplace! Very quiet in operation and extremely efficient at conserving your essential oils. The Ace features controls for everything from timer to output pressure. Aroma Ace is the most advanced nebulizer around. The powerful pump allows for greater dispersion of a micro fine essential oil mist which may be absorbed deep into the lungs due to the extremely small particle size. 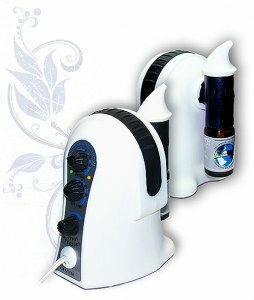 This aromatherapy nebulizer uses state of the art technology but is so easy and simple to use. Only takes minutes from box to set up. A truly professional product for those serious about Aromatherapy.